TrafFix A-Frame is made of rigid impact resistant polyethylene and its' legs are sand fillable for ballasting, stackable for storage and transportation. Each A-Frame leg can be used with the TrafFix I-Beam Rails, Phoenix Plastic Rails, or lumber. 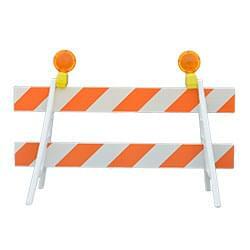 TrafFix Devices plastic folding barricades are made from durable polyethylene. The lightweight and easy to handle Blow Molded plastic legs provide increased strength to minimize damage and prevent sagging. 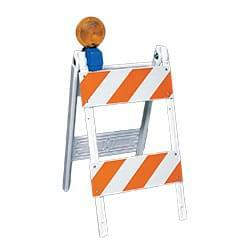 TrafFix Devices Type III Barricades meet all of your Traffic safety needs. 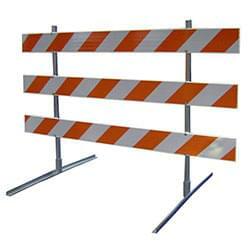 Type III Barricades are larger and and offer better stability and visibility compared to type I & II barricades and are available in a variety of lengths. 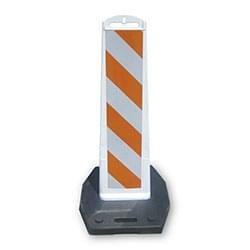 The TrafFix Vertical Panel Barricades are made from durable blow molded polyethylene panels and recycled rubber bases. Both panels and bases can be stacked separately for easy transportation and storage. 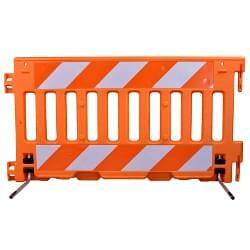 The TrafFix ADA Wall is used to create hand guided safe passages through workzones that meet ADA requirements. The ADA Wall is MASH Tested, Passed, and Eligible as TL-3 Longitudinal Channelizing Device. 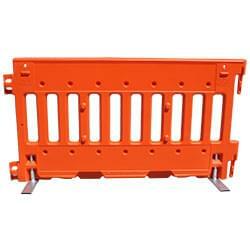 The TrafFix Urbanite creates a continuous hand guided safe passage through workzones. The Urbanite is made of UV stabilized, high density polyethylene.